Here’s a fun Christmas food craft kids will enjoy. 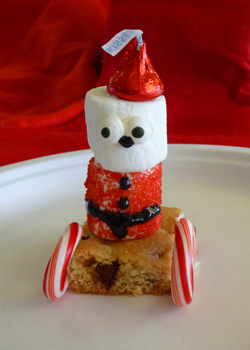 It’s a marshmallow Santa riding a sleigh made of a chocolate chip cookie bar and little candy canes. Start by baking your chocolate chip cookie bars according to the directions and allowing them to cool. Cut the bars so they’re slightly longer than the mini candy canes. Then use icing to attach the candy canes to the sides of the bars to create the sled runners. Now set aside to let the icing dry while you create the lower part of the marshmallow Santas. Start by melting the butter in a small microwaveable dish. Now roll half the marshmallows in the butter one at a time, getting just enough butter to coat the outside. Then move the buttered marshmallow to another bowl and sprinkle the sides with red sugar. Use the black icing to create buttons and a belt. Then place the coated marshmallows on top of the cookie sleds and use a toothpick to secure them. A portion of the toothpick will be sticking out of the top of the marshmallow. Leave this so you can secure Santa’s head. With the remaining marshmallows, use a small amount of black icing to stick the candy eyes or M&Ms to the marshmallow. Then add an icing nose. When you’ve finished with the face, stick it on top of the toothpick in the red coated marshmallow. Add a small bit of icing to the top of the marshmallow, and then stick a Hershey’s Kisses on the top to create Santa’s hat.